In School Loop, all discussion will include at least one school or district staff member. There are no discussions that include only students and/or parents. While all active discussion topics are kept front and center on each user's portal homepage, it's really up to district and school staff to monitor their discussions. 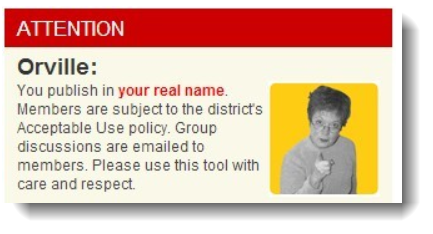 As previously stated, School Loop does force all posts to be in the user's real name and that feature goes a very long way to ensure appropriate behavior. We've seen cases where students have moderated the post of other students. It's a beautiful moment when that sort of thing happens. School Loop has many rules that restrict interactions between parents and students. For the most part, they cannot communicate. The only exception is a group discussion where both students and parents are members. These discussions though are public to all of the members of the group, and all groups have at least one district or school staff member.